"Saint Gregory" redirects here. For other uses, see Saint Gregory (disambiguation). ^ a b c "St. Gregory Dialogus, the Pope of Rome". oca.org, Orthodox Church in America. Retrieved 20 April 2018. ^ "St. Gregory the Great". Web site of Saint Charles Borromeo Catholic Church. Retrieved 14 November 2009. ^ Saraceni, Carlo; Emil Kren; Daniel Marx (1996). "St. Gregory the Great". Web Gallery of Art. Retrieved 23 August 2008. ^ Bede, Ecclesiastical History of the English People, Book I section 27 part II. Bede is translated in Bede (1999). McClure, Judith (ed.). The Ecclesiastical History of the English People: The Greater Chronicle ; Bede's Letter to Egbert. Oxford University Press. ISBN 9780192838667. ^ A monk or nun at Whitby A.D. 713 (1997–2008). Holloway, Julia Bolton (ed.). "The Earliest Life of St. Gregory the great". Julia Bolton Holloway. Retrieved 10 August 2008. Wikimedia Commons has media related to Pope Gregory I. "Documenta Catholica Omnia: Gregorius I Magnus" (in Latin). Cooperatorum Veritatis Societas. 2006. Retrieved 10 August 2008. Index of 70 downloadable .pdf files containing the texts of Gregory I.
Gregory the Great (2007). "Homiliae in Ezechielem I-XXII". Codices Electronici Sangallenses: Codex 211 (in Latin). Stiftsbibliothek St.Gallen. Retrieved 10 August 2008. Photographic images of a manuscript copied about 850–875 AD. 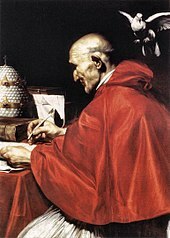 "St Gregory Dialogus, the Pope of Rome". Orthodox Church in America. Retrieved 10 August 2008. Orthodox icon and synaxarion.